You expect heartwarming stories from Reader's Digest magazine, and you won't be disappointed with "Alive! 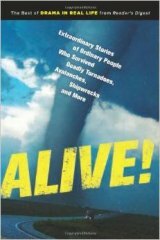 : Extraordinary Stories of Ordinary People Who Survived Deadly Tornadoes, Avalanches, Shipwrecks and More!" by the Editors of Reader's Digest (Reader's Digest Association, 224 pages, $15.99). The stories collected in this book are from the archives of the popular magazine, dating back to the mid 1990s and as recently as 2012. In "Super Storm," Rick Gregory, an off-duty patrolman watches an F3 tornado ravage his small Tennessee town where split-second decisions make the difference between life and death. In “Avalanche!” Luke Edgar, a young father and backcountry snowboarder goes out with a buddy for a fun day on Mt. Rainier and gets buried alive in an avalanche. “Swarm,” tells the story of the Walker family, out for a day trip in the Florida marsh when they get entangled in a yellow-jacket nest. The mother, Debbie, fighting anaphylactic shock must leave her injured husband and children in order to find help as time runs out. Tony Farrington tells the harrowing story of the crews of three sailboats who run into an unimaginable storm in the normally calm South Pacific. Whether out on a planned adventure or simply in the wrong place at the wrong time, the heroes of these stories are connected by their fierce desire to survive against all odds. Wildfires, blizzards, attacks by grizzlies, jet crashes in the jungle, are just some of the conditions people face in these stories of survival. Readers will have an up close and personal view of events as they follow adventurers and laymen alike as they face down nature’s fury in the most extreme circumstances, and find strength they didn’t know they had, proving the depth and resilience of the human spirit. As a resident of Southern California from 1976 to 1992, I was particularly impressed with "Trapped by a Killer Firestorm" by Mark Stuart Gill," beginning on Page 38. Gill tells the story of how an elderly survivor of the Armenian holocaust, Hazel Bedrosian, was rescued by her 17-year-old grandson, Eddie Bedrosian, from the flames scorching a Malibu hillside. Eddie was wondering what to write about for a personal essay required for college admission. After his heroic rescue of Hazel, he didn't have to worry about what to write!